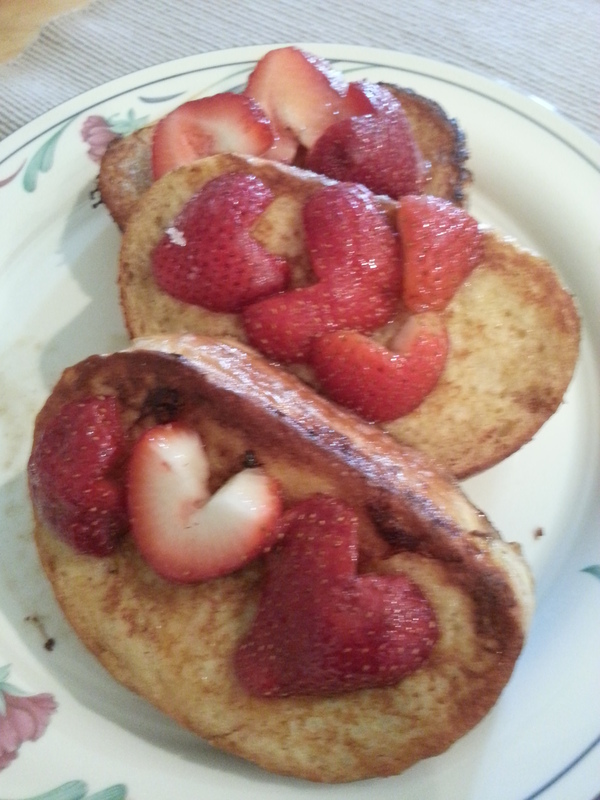 As Valentine’s Day approaches and you make plans for dinner or maybe a getaway for the weekend, why not make a delicious breakfast made with love and strawberry hearts for your valentine. This French toast is sure to satisfy your love’s tummy and their sweet tooth. And if you haven’t had Nutella before, I promise you are going to fall in love with it after making this. Combine all of the batter ingredients in a large bowl, mixing well until incorporated. Keep it refrigerated until ready to use. Mix together the cream cheese and Nutella until completely combined. Slice your bread into 1 1/2 inch slices and cut a slit in the middle to put your filling. Smear about 1 1/2 tablespoons of the filling inside the bread. Dip bread into batter mixture, allow to soak for about 30 seconds on each side, and then remove to a cooling rack that is sitting on a sheet pan, and allow to sit for 1 minute. Heat a large saute pan and then add butter. Cook until golden brown on both sides, approximately 2 minutes per side. Remove from pan and place on rack in the oven for 5 minutes and serve immediately with the toppings. This reminds me of Paris where Nutell is King! Yes it is! If you make this recipe, let me know what you thought!